Man that looks good right now. It is 9:06pm and I could go for one of those hot out of the oven! I think I like making cookies more than anything. I almost always have some cookie dough in the frig just waiting to go into the oven. 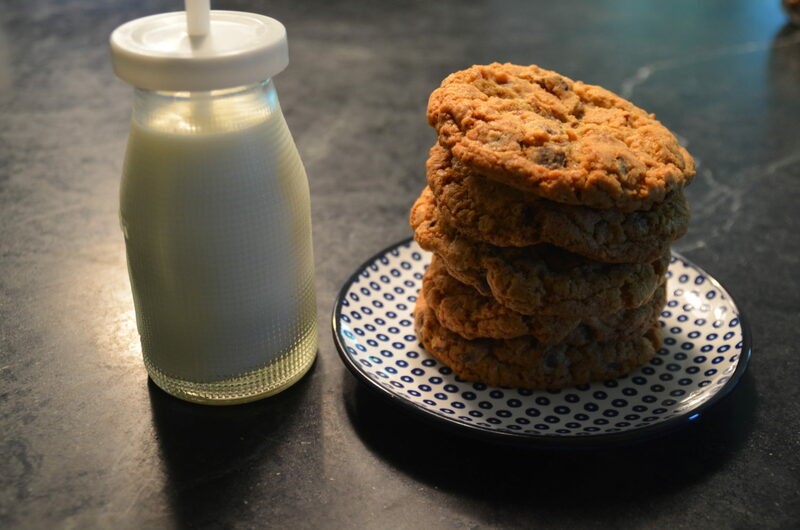 If you think you don’t make good cookies, you probably don’t do things in the right order and you probably over beat them. Also you have to use the right ingredients, no cheap margarine or cheap chocolate chips. Cheap eggs are ok. HaHa but Egglands best are really good. Did you know Land O Lakes owns them? My husband works for Land O Lakes but not on the butter side. In the bowl of an electric mixer fitted with a paddle, beat butter until soft then add sugars just until combined. Add eggs one at a time, beating 30 seconds in between. Add salt and baking soda to the measuring cup and then put flour on top. Dump into mixing bowl. Add rest of flour. Beat on low just until combined. Scrape bowl down and beat on low a couple of more seconds. 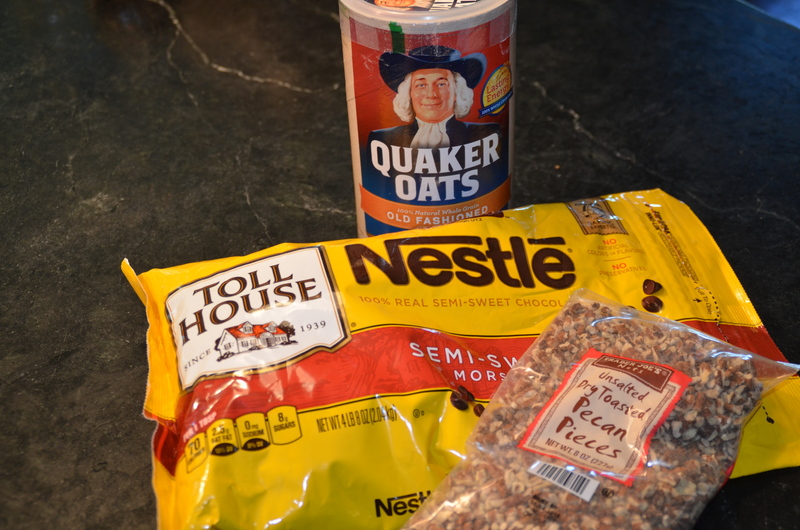 Add oats and beat a few seconds. Then add Chips and pecans. Line a cookie sheet with parchment paper. 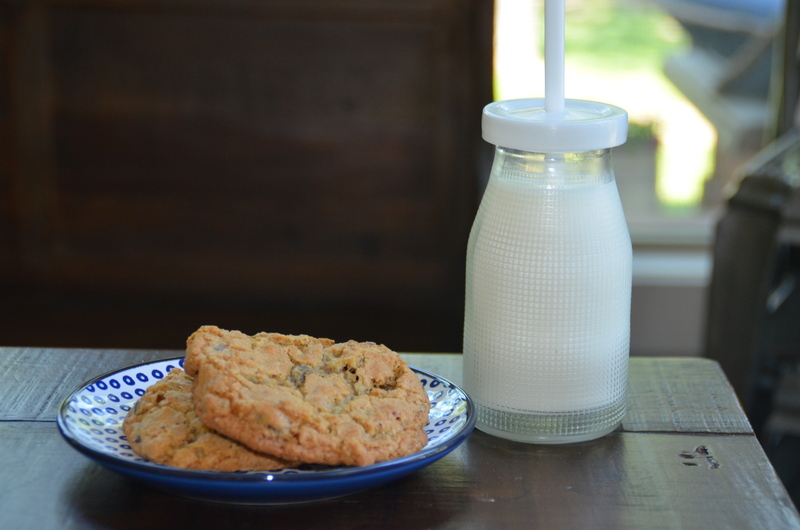 Using an ice cream scoop, place cookies 2 inches apart. Bake at 350 for 16 minutes. If you have a Trader Joes in your area, these toasted pecan pieces are great. They also have half pecans that are in the same aisle that are roasted and salted. I also use those a lot for baking. Very reasonable too. I only use Nestle semi sweet Chocolate Chips. They are the best. Remember, don’t beat them to death and your cookies will turn out better. By the way, these cute little milk bottles are from Amazon. I will post a link later.